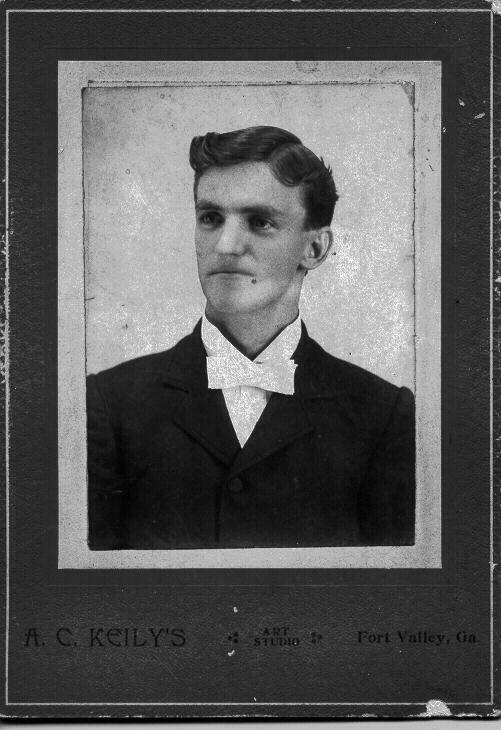 Mr. Mac was born in Marion, Marion, South Carolina on October 19, 1875 to William Cicero McMillan 1836-1889 and Martha Isabelle (Mattie) Porter 1845-1906. He was the fourth child. His father was a pharmcist. His drug store began with few enough items to be held in one peach basket. Upon his death his inventory was almost 100 pages of handwritten items on legal size paper. He only remembered one occasion when his father praised him. He was planting beans and his father said he had planted the best straight row. The rule of the house was when the clock finished stricking nine they must all be in bed. There was a mad dash when the clock struck the first chime for them all to get upstairs and in the bed. He moved to Fort Valley to work in a lumber yard. He roomed with Mariah McGeehee. On the mantel was a picture of a young woman. He asked about her and was told she lived in Tazewell, Va. He asked permission to write to her. From this beginning he corresponded, met, and on 27 Dec 1905 James Sidney McMillan married Margaret Austin White in Tazewell, Va. The ceremony was performed by the brides' grandfather, Samuel Wesley Austin. Both of them were brought up in religious families, their grandfather's were preachers. His, John Alexander Porter, was a Methodist minister in South Carolina. The family moved a lot, most of his pulpits were for 1-2 years. Margaret's grandfather Austin was a minister in the Church of Christ. Much of their home life revolved around their faith and church. Their home in Fort Valley was across the street from the Methodist Church. It became a meeting place of all sorts of church functions. The dining room table would seat 24 people. Many times ministers visiting took advantage of their hospitality. Mr. Mac bought a hardware store in Ft. Valley. There was one customer who was in the habit of trying to buy something for less than the asking price. Mr. Mac got tired of this and watched as the man approached one day. He changed the price of the razor blades from 5¢ to 15¢. The man, true to form, tried to get the price to 10¢. This was the price decided upon and both men were happy. The man thought he had saved 5¢ and Mr. Mac got double his original asking price. He and Margaret had five children total. Two of them died at an early age. There were two boys and three girls. Due to his allergies, he was advised by his doctor to move to a different location. He chose to move to Eustis, Florida in 1928 working as a fertilizer salesman for Truman Fertilizer Co. in Jacksonville, Fl. He was known for his honesty and would go to the shed where the fertilizer was stored, determine the amount the farmer would need and place the order. He also would drive thru the orange grove to see the condition of the trees and what type of fertilizer they needed that time. The family did not move down permanently until the youngest child had graduated from high school in 1932. True to form, the family gravitated to the part of Eustis where the churchs were located. They settled on First Presbyterian Church and the family home was always within 3 blocks of the church. 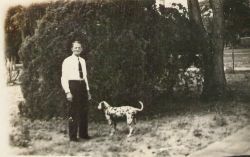 His trusted companion was Domino, a Dalmation dog who traveled with him on his rounds. He had taught Domino many tricks. One story that is still enjoyed to this day is the farmer who grew tomatoes in an adjoining county. Mr. Mac was there sitting on the porch shooting the breeze with the farmer and his wife. They got into politics. She said, "Mr. Mac, who are you going to vote for?" He looked at Domino and asked the dog, "Would you rather vote for Al Smith or die?" Domino immediately rolled over and played dead. The wife turned to her husband and said,"It does seem to me if a dog knows how to vote, your would!" Domino was a smart dog. He would go into the post office, place his paws on the window and the post mistess would give him a piece of junk mail and Domino would bring the mail out to Mr. Mac at his command of, "Domino, go get the mail." One day Domino took a long time in the post office. Mr. Mac went to see what was going on. He remembered it was Wednesday and the post office was closed. As he entered, Domino was on his way out with a piece of paper in his mouth. The post mistress was exiting at the same time. Mr. Mac asked if she had given the paper to Domino. "No," she said, " I had closed the window and saw him come in. I watched to see what he would do. Upon seeing the window was closed he moved to the garbage can and retrieved a piece of paper." 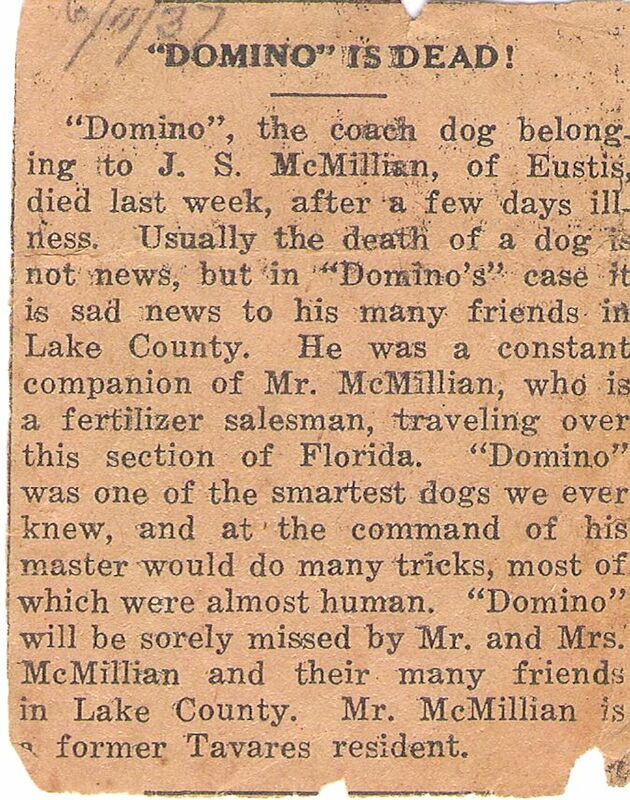 Since Domino was known as well as Mr. Mac, his obituary was printed in the Tavares Citizen Newspaper in 1937. There are many other stories about Domino and his tricks. Even today I hear new ones. He worked for many years for Truman and then when that business was sold, he began working with Foremost Fertilizer in Leesburg. He was active in his work until shortly before his death on Oct. 18, 1962. He was predeceased by three of his children and his wife.